A very, very cute Pathani kid has taken the internet by storm. He is such an adorable munchkin you will just want squish him up. Believe me, he is that cute. Now, this little one is referred to as ‘Peeche Dekho Boy’ or ‘Pathan Ka Bacha’ by netizens ever since his video went viral on Facebook, and later on Twitter and Instagram. Some people say this cutie patootie’s real name is Ahmed Shah and that he lives across the border in Pakistan. While we cannot authenticate this claim as of now but remain in awe of ‘Peeche Dekho Boy’ innocence and cuteness that has btw sparked a crazy meme-fest. Netizens are using his cute stills and his endearing dialogue to troll biggies, right from Virat Kohli to Salman Khan. 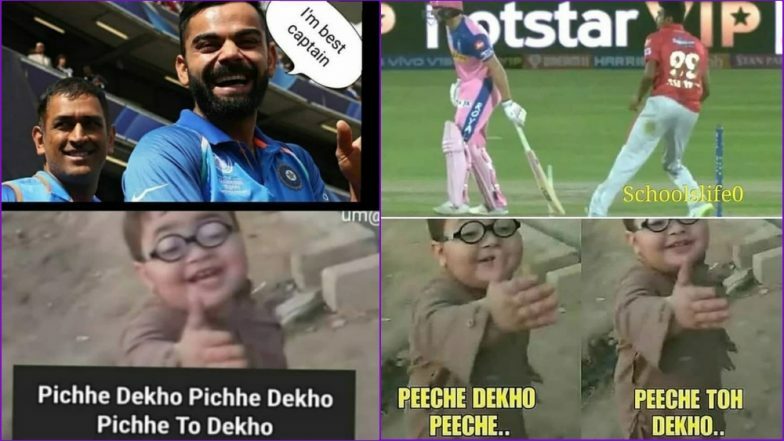 Yes, poor Virat, as if funny RCB memes were not enough, netizens are taking potshots using these cute kid memes. Adorable ‘Peeche Dekho’ Boy’s Viral Video Is Spreading Cuteness All Over the Internet, People Compare the Little Pathan Boy to Taimur! Virat Kohli, world’s best batsman both in Tests and ODIs, seems to be a meme-makers favourite subject. And we kind of do not blame them as the 30-year-old Indian cricket team captain is having a nightmarish time leading the Royal Challengers Bangalore (RCB) side in the VIVO Indian Premier League (IPL) 2019. Virat & Co. have lost six matches on a trot and are still in search of their first win of the season. With cricket gods not in favour of the most-sought-after cricketer in the world at present, he cannot but accept the brutal trolling. Check out how netizens are using social media’s latest sensation, ‘Peeche Dekho Boy’ to troll Virat Kohli and others. Funny RCB Memes Go Viral Again As Virat Kohli and Co Take on Kings XI Punjab in IPL 2019 Match. Fans of ‘Peeche Dekho Boy’ are also comparing him to Taimur Ali Khan, the two-year-old son of actor couple, Saif Ali Khan and Kareena Kapoor. Everyone knows the kind of fan following little Taimur enjoys, both by paparazzi as well as aam janta. But with the entry of ‘Peeche Dekho Boy,’ fans are going gaga over his chubby cheeks and innocence. Check out how fans are reacting to ‘Peeche Dekho Boy’ and little Tim’s hypothetical ‘attention war’ on social media. Viral Videos: From Karnataka Minister's Nagin Dance to Cute Pathani Kid's Banter; Watch Top 6 Clips of the Week. There’s no doubt social media is a dark and tedious place to be hooked on to but then again cuties like our new online sensation ‘Peeche Dekho Boy’ makes it worth the stay. You simply cannot get enough of his cuteness. His toothy smile, his round Harry Potter-style spectacles, his chubby cheeks, his pathani suit, his adorable chappals, his curiosity and his boldness, to not take any sh*t from anyone. ‘Peeche Dekho Boy’ is inspiring me so much right now.